What do you see when you watch the video? A young artist selling himself out to the narrow ideals of commercialized hip-hop? A dangerous hoodlum who belongs in jail? A thoughtless kid who is obliviously perpetuating racial stereotypes of black men? Shmurda is a victim of white music executives, who throw money at him to portray a rigid, idealized character of the young black thug. Why? Because white suburban kids get a thrill out of imagining hundreds of black kids toting guns and selling drugs. Because rich white guys can sleep at night knowing that they are personally responsible for continuously codifying black men into a singular image of the dangerous black thug. It’s just another reason to throw that kid into jail for having a gram of marijuana, or saying the wrong words to a police officer, or making the wrong motion with his hands. The more black people we throw in jail, the less we have on the streets, and the more money we have in our pockets. Somewhere, a rich white music executive is leaning back in his office chair, cheesing. He’s a victim of peer-pressure, that suffocating presence that captures young black men in poverty, tempting them to protect themselves with gangs and violence and drug money. For many young black men, gang affiliation is not a choice. If you grow up on a certain black, you are assumed to be part of gang. If you aren’t affiliated with one gang, you are assumed to be part of another, and your life is in danger. If you want to walk home from school without getting mugged or shot, you need the protection of your peers. If you want to make anything over the measly minimum wage, you need to deal drugs. This cultural dilemma is a direct product of the four-decade war on drugs and the failures of the public education system. As long as drug dealing produces more money any job that doesn’t require a college degree, young black men will resort to gang affiliation. Blaming Bobby Shmurda for perpetuating racial stereotypes is victim blaming. It’s like blaming women for getting sexually assaulted because of the way that they dress. 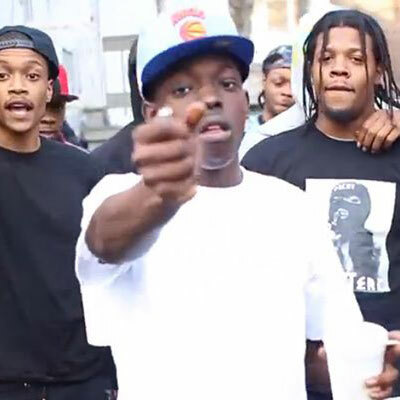 Shmurda is not the first to release a music video bragging about his crew’s violent tactics and drug money earnings, and he certainly wont be the last. He is one of many rappers who fall victim to the temptations of white music executives, and we can’t blame him for that. We can, however, encourage more funding for public education and after-school programs. We can start supporting artists who promote socially conscious lyrics. We can stop supporting white music executives and turn off the radio. We can end the war on drugs and provide our youth with rewarding jobs that pay enough to feed families. We’ve got a lot of work to do, but there is no time for blaming victims. We don’t need to give that rich white guy another reason to sit back in his chair and smile about his misrepresentations of black culture.